Since the early 1990s Andreas Gursky has digitally manipulated his photographs in order to gain more control over his images. This digital streamlining has resulted in an ever-increasing smoothness and flatness in his work, although the grid is often retained to provide structure. The eye is led across rather than into the composition, forcing the mind to puzzle over its content. This is true of ‘Centre Georges Pompidou’. Here the open yet minimalist structure of the Renzo Piano-designed building is host to an exhibition of plans and models by the Swiss architects Herzog & de Meuron. Arranged on trestles and low plinths, none of the exhibits can clearly be seen. The people looking at the material are, as is usual in Gursky’s work, not engaged with the viewer. 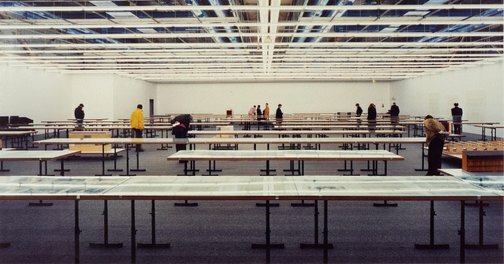 ‘Centre Georges Pompidou’ depends on the horizontal grid of the trestle tables and strip lighting above, reflecting the structures of modern life back to the viewer. Andreas Gursky works 80-08 , 2008, 141 (colour illus.). 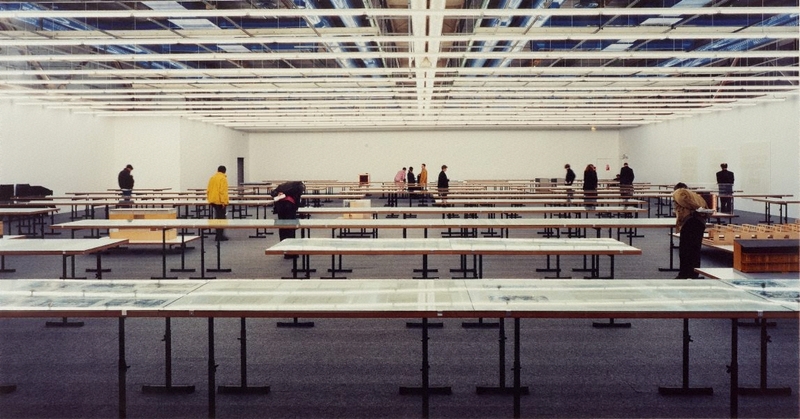 John Kaldor family collection: Art Gallery of New South Wales , Sydney, 2011, 236, 240-41 (colour illus.). Parkett 44 , Zurich, 1995, 94-95 (colour illus.). Images / Andreas Gursky , 1995, 13 (colour illus. ).